Let’s just say that, hypothetically, someone was thinking about selling some stuff and getting new brown boots. Let’s also say that, hypothetically, this person wants something a little bit different, not quite so “off the rack” and boring looking. But of course, hypothetically, they have to be relatively inexpensive. They also have to, hypothetically, come tall enough to fit said person, who likes at least a 19″ height. This completely hypothetical person loves her Tuccis, but has a budget like 1/3 of that. So the standards are hypothetically ridiculously, probably unrealistically high. Oh, and they have to be pretty enough for showing, a nice chocolate color, but also hold up reasonably well to regular everyday type use. Um, hypothetically. These are the cheapest of the bunch, coming in at under $300 USD, although I’m having a hard time finding them in the Tall height. They’re also probably the most average as far as quality, comparable to something like Mountain Horse or Ariat. The accents are patent croc, so a little bit fun. For the money though, they’re about as pretty as you can get, and they’re not boring. These are a semi-custom brand that has blown up lately due to the extremely reasonable prices in Europe. They’re a little bit more than the ones above, but not by a whole lot. The leather seems to be better quality. They come with a patent top but I think I can change it out for something else if I wanted. We’re getting a little more expensive now, but they’re a major brand of very good quality. I don’t love the grain leather, really, and I could upgrade to smooth but it would cost more. I like pretty much everything else about them though. Just not sure if I LOVE them enough to justify the higher cost? Another major brand, and reasonably affordable. I’ve never been much of a patent croc fan but it’s working for me on these. They have a few different options on the top but they’re like… glitter and snakeskin which are a bit much in that large of a quantity. They’ve got the longest lead time of the bunch, at 12 weeks. I’m trying to decide if that’s too much glitter for my taste… but same brand as above, different style to the top. About the same price, too. Maybe a little more fun/unique. I can’t decide if I really love them or really don’t. Hypothetically, I like boot A. I love the subtle detailing of the patent accents and the color. They’re lovely. I somehow hit the luck jackpot and got brown dehners in my size on ebay for $150. I wear them more than the custom black ones i got a few years ago because BROWN OBVI. I’m having very little luck finding boot A in a tall. As in… not without special order. Which makes them as expensive as the rest. If i *hypothetically* wanted to now research and *hypothetically* purchase these boots myself would you be able to post links and/or manufacturers? 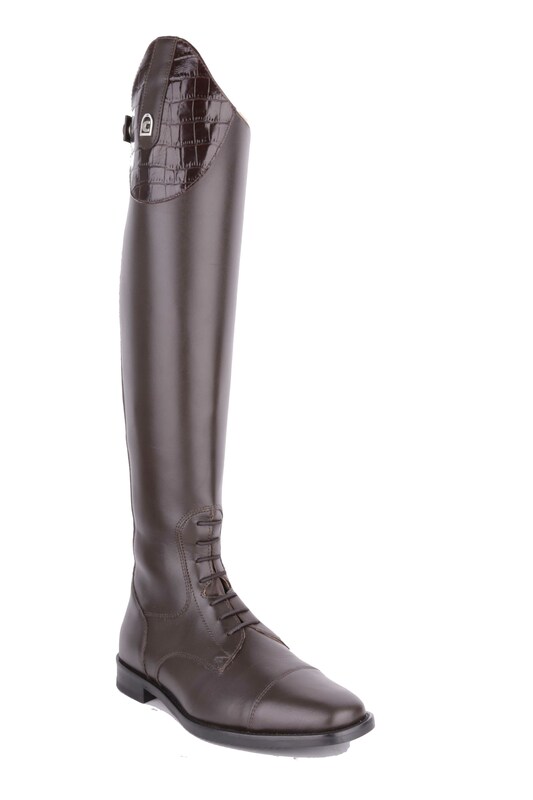 The glitzy & patent accents are making my hunter-princess-turned-jumper-rider heart sing. They’re Brogini, Pioneer, DeNiro, and Cavallo. I would go with boot B or maybe boot A. The last one is way too glittery for my taste, I dislike the croc top and the grain leather looks just so dull. Plus I don´t like the shape of that boot…. I really think boot B looks best. Thank you! I’ve been a little bad lately and acquired some beautiful brown saddle pad/bonnet combos.. and my every day boots bit the dust. So this could be a necessary splurge in near future. so afraid to go down that rabbit hole… then it would be brown gloves, helmet…. i already have brown gloves and brown helmet, because of my first couple pairs of brown boots, so I can attest to the fact that it is definitely a slippery slope. Sounds like you just need the espresso motion lite and one of these hypothetical boots and you’re set! I’m waiting for RW to carry it. “Hypothetically” this may be the most tempting post ever! Especially the semi-custom boots. Since even my dressage tack is brown, I totally see the appeal. 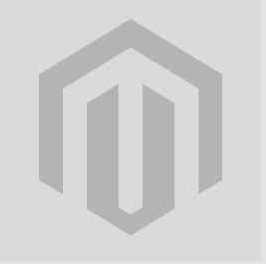 Are you going to provide links to these “mystery” brands? All pretty boots!! hypothetically I think I like boot A best… although I think boot C could be nice if it had smooth leather. 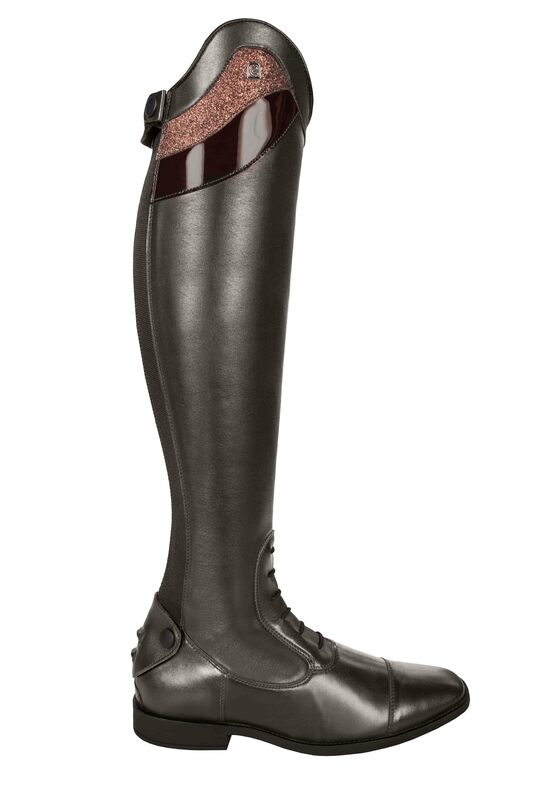 I’ve always liked the look of the mountain horse Sovereign boots. But in the dark brown (as opposed to the two toned brown one). I’ve never seen them in person though, so can’t speak for quality. Thank goodness none of these are dress boots, because damn I want a pair of brown dress boots to go with my brown coat. I have a pair made by the same co as Hypothetical D, and they are super comfortable and have a variety of Really Tall Options (like mine are 52 cm tall and man they are tallll). Also almost bought a pair made by Hypothetical C and they were frickin’ fantastically comfy but I couldn’t stomach the price (they were also super custom and shiny and… swoon… but I digress). Would vote for D based on previous experience, and pretty sure you can get some options other than croc. Also would recommend seeing what they have when you’re in England, although depending on the exchange rate it may not help much. The options other than croc are not so great, though. It would be ok in a smaller dose, but that’s a BIIIIIG area to put glitter or rhinestones or snakeskin. I have a pair of DeNiro quick softs (same grain leather as boot C), and while they are super comfy, they do not seem durable. They work well for my purposes, which is lessons 1-2x a week, but I don’t think they would hold up well enough for heavier use. They scuff easily and the scuffs really show, because the leather layer below the top brown layer is a much lighter color. Not sure if this would also be the case for the smooth leather. I got mine for ~$200 lightly used, so I’m not mad, but I thought I would warn you and anyone else looking! Ok, so Boot A hypothetically needs to come live with me because my brown boot zippers have just about given up… Care to share where you found these..? Brogini Sanremo. I can’t find them in the Tall, unfortunately, and the regular is too short for me. Have you looked at Celeris boots? I actually really like E, and I am not a glitter person whatsoever!! I would hypothetically go for A. I may also go hypothetically look up A myself. hypothetical means you can’t even prove it’s ME, much less that I’m looking in windows. I bought a different pair of Broginis back in September when I moved to the UK, rode in them about 3 times a week, and the zipper blew out the day after Christmas. I have no idea if I just had bad luck with them and got a dud or what, but I was really disappointed. I am tempted to buy another pair, but don’t want it to happen again. They also did run *really* short. Like I prefer tall but can make do with regulars usually, and based on the size chart they should have been fine, but they were unbelievably short. It was ok as I was just schooling in them, but if you have issues with the height you may not like them. They’re fairly common here, and the shortness seems to be an issue on everyone I’ve seen wearing them. I can’t find the Tall anywhere anyway, so I’ve already crossed them off!